What Exactly is Konami's "Piece Walker" Site Getting At? 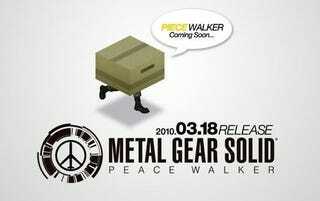 This site is not the Metal Gear Solid: Peace Walker portal. This site is. So what exactly is Konami touting with this picture of sneaky Snake equipping a box. What's going on? Beats me, What, you thought I was gonna tell you on the jump? Siliconera noticed the "Piece Walker" portal, but has no clue, either. The only links on the page are to Konami, Kojima Productions, and the Peace Walker demo.